HTL is committed to providing our customers with innovative, high-quality products, factory-authorized repair and calibration services. Our quality management system ISO 9001:2008 ensures that all vital processes in the company are strictly controlled. All HTL products are operate under ISO 8655 standard. Selected product series used in the In Vitro Diagnostics fields conform to the IVD 98/79 EEC directive for medical devices and are CE certified accordingly. HTL has a well-established quality management system. First ISO 9001 certificate was acquired by the company in 1998. 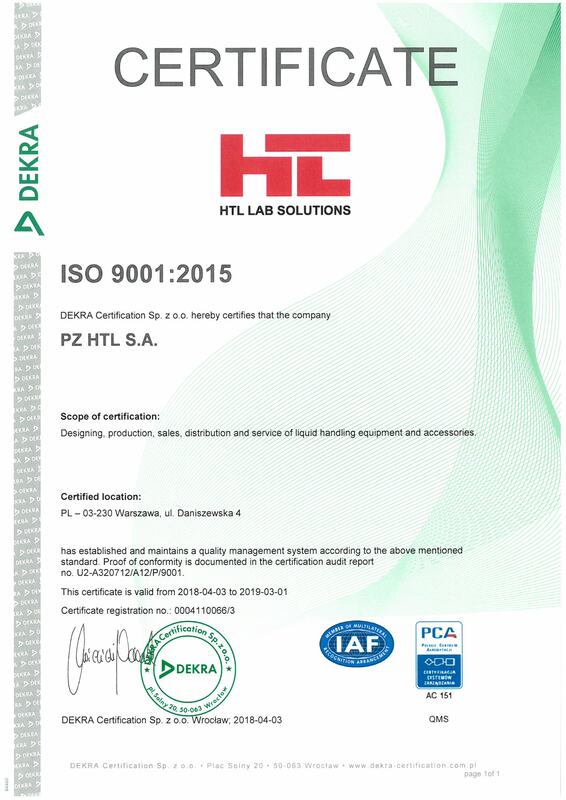 In May 2004, PZ HTL S.A. qualified, as one of the first enterprises in Poland, for the ISO 9001:2015 certification. Since the beginning of our work within the ISO guidelines, our certifying body, KEMA Quality B.V. (DEKRA Certification since 2010), has been respected. Our sophisticated quality management system ensures that all vital processes in the company such as product development, purchase and quality control of the raw materials, component manufacturing, product assembly and quality control, logistics, sales and marketing are described, recorded and strictly controlled. HTL manufactures its products in conformity with GMP guidelines and the European Medical Device Directive. Since mid-2004 all pipettes manufactured by HTL are CE marked. Stringent quality control is the key of the success of HTL’s products. Within many years of manufacturing manual liquid handling systems we have worked out the control procedures allowing us to ensure that only 100% reliable product reaches the end users. Thanks to the harsh durability tests and precise accuracy and precision verification performed on all of our products our equipment is renowned for its sturdiness and long lasting reproducibility. The testing results automatically enter computer control system which independently qualifies if the certain pipette meets company standards. Only once all tests are passed the Quality Control Certificate stating the performance of the product is being printed. Quality Control Certificate presents true accuracy and precision results obtained during the control procedure of the certain pipette. The certificate is included in pipette box. HTL stands out from others thanks to its personalized service and ability to listen to the market and deliver products accordingly. In recent years, the HTL placed particular emphasis on shortening delivery times, improving service work and to strengthen cooperation with distributors. By working closely with our partners, HTL continuously monitors the changing market trends and innovations in the field of medical and laboratory worldwide. Trying to meet the demands of our customers, HTL puts a strong emphasis on creating new products, as well as the modernization of existing ones. One of the main goals of the company is to increase sales of our products in the domestic and foreign markets. Today HTL products are distributed through the network of 145 distributors in 80 countries world-wide. Distributors in Poland have their representative offices throughout the country. HTL aims to stabilize the distribution network through commercial and technical training organized for distributors. Take action aimed at protecting natural resources by reducing paper consumption, electricity and fuels. In the production processes we use technologies and materials safe for people and the environment. We are rational waste management through segregation used consumables, equipment and packaging purpose of their disposal or recycling. We improve production systems in order to reduce their environmental impact. We conduct strict supervision of chemicals used as described in “Proceedings of chemicals”. We promote pro-environmental awareness among employees, suppliers and business partners through a systematic information campaign. Regularly conducted environmental audits are aimed to identify potential threats and incompliances and to take corrective measures. On-going monitoring is provided to implement pro-environment measures in new areas and to improve Environmental Management System. 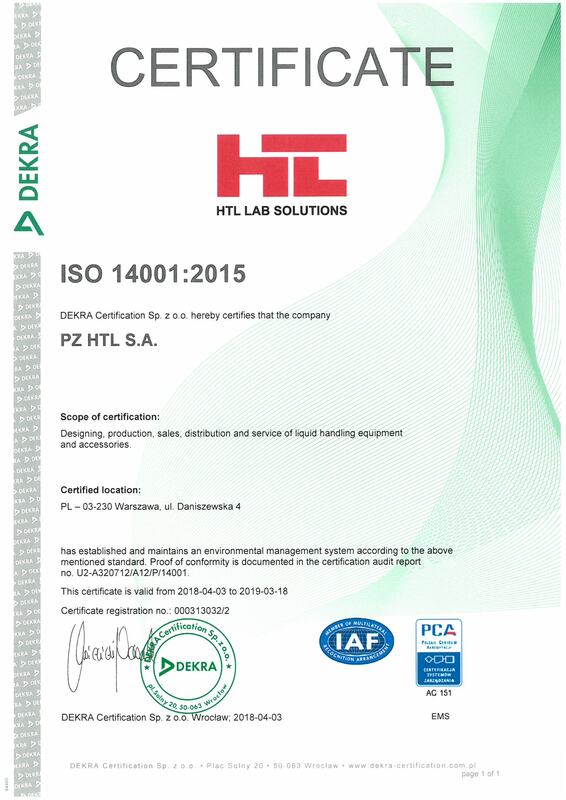 In 2013, PZ HTL SA obtained the Certificate of the Environmental Management System ISO 14001:2015. The System was certified by DEKRA Certification.